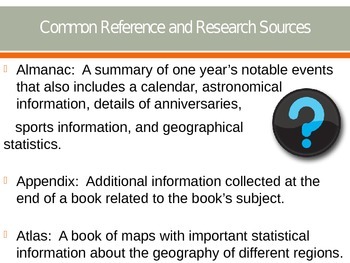 This resource covers almanac, appendix, atlas, card catalog, dictionary, encyclopedia, table of contents, glossary, index, and reader's guide. 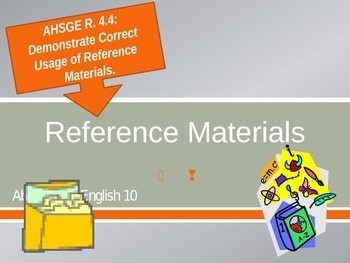 Also, the presentation explains how to use a dictionary, glossary, and table of contents; and examples of table of contents and index. The encyclopedia section also includes a practice section. After each section, there is a short quiz/ recap about the information previously presented. 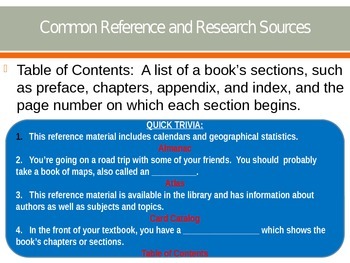 This is a great resource that constantly checks and encourages student knowledge. 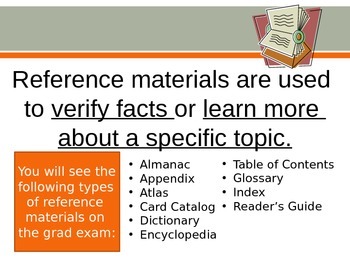 Students can expect to see reference material on a variety of reading tests, like ACT, SAT, EOCT, and MORE.